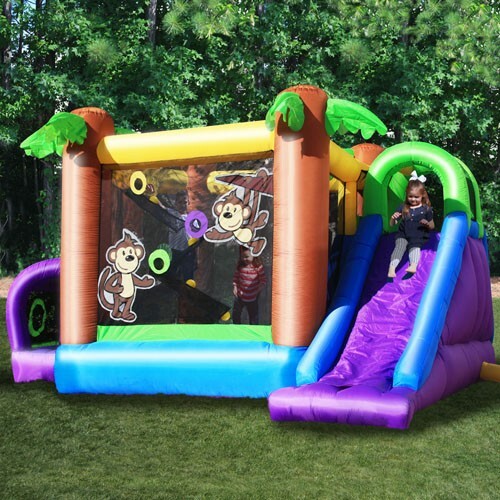 Features a monkey game, slide, bouncer area, and a crawl tunnel! 25 PVC balls included for the monkey game. The KidWise Monkey Explorer Jumper is packed with one of a kind features! The unit overall dimensions are 16 x 13.5 x 8ft tall. THE ULTIMATE MONKEY PLAYTIME FUN! The KidWise Monkey Explorer Jumper has it all. Featuring a double entry crawl through tunnel, approximately a 10ft x 10 ft bounce area for open play, and a 5 ft tall slide that can be accessed from inside or outside the bouncer, and a rockwall. The best part is the double meshed front wall that features the Monkey Game with 3 holes for kids to toss balls into the net. The balls will then work their way past the Monkeys and roll back down to the ball pit floor. 3 holes at different heights allow for kids of all sizes to play. With so much to do your kids are sure to love this great bouncy house.